Provide your bathroom a custom-style, Bohemian inspired look with the beautiful Brienne French-Style Frameless Alcove Hinged Shower Door. The Brienne's Blockpress mullion design projects a bold matte black pattern with a fluid, frameless presence. Comprised of premium, thick 3/8 in. (10mm) tempered clear glass, its slimline wall channel provides a generous 1-inch of adjustability for out of plumb, ensuring a water tight fit in your existing shower alcove. This model includes Aston's professionally applied StarCast protective glass coating, which delivers lasting clarity and easy, low maintenance care. It's designed for either right or left hand installation. With a multitude of available sizes ready-to-install (72 in. 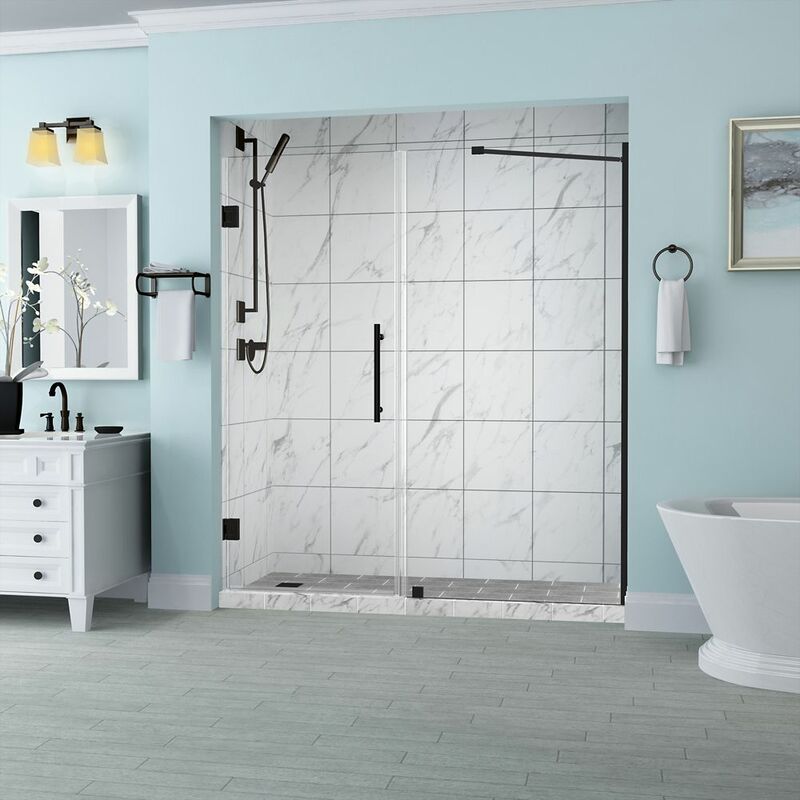 height), the Marais French-Style Frameless Alcove Shower Door will instantly convey a sophisticated, luxurious showering experience in your home. Instantly transform your existing shower alcove space and upgrade your bath's design with the Aston Soleil 60 in. Frameless Hinged Shower Door with left drain base. Constructed of durable 6mm ANSI-certified tempered clear glass and your choice of either chrome or stainless steel finished hardware, you can achieve a custom-look in your bath at an attainable cost. The Soleil is configured for reversible right or left hand door installation and Includes two interior glass shelves designed with convenience and functionality in mind. This model includes matching 2.5 in. low-profile left-hand drain fibreglass reinforced acrylic shower base. Belmore 53.25 inch to 54.25 inch x 72 inch Frameless Hinged Shower Door in Oil Rubbed Bronze The Belmore Frameless Hinged Shower Door provides universal sophistication and quality craftsmanship to your bathroom's decor. Available in a vast array of sizes, the Belmore is designed to meet the solution of uneven walls with its inline wall channel providing up to 1 inch out-of-plumb adjustment. The Belmore comes ready to install and will breathe new life into your existing bathroom's interior. Its StarCast by EnduroShield coated premium clear 3/8 inch tempered safety glass; tested and certified to ANSI Z97.1 Standard, hardware constructed of durable stainless steel and leak-seal edge strips make the Belmore a smart, stylish solution to your existing alcove. A perfect door with a perfect fit, only from Aston. Shower base not available. Images are for representation only. Once installed, glass may differ slightly than shown in image due to light absorption and reflection. Belmore 53.25 inch to 54.25 inch x 72 inch Frameless Hinged Shower Door in Oil Rubbed Bronze is rated 4.9 out of 5 by 36.